I knew this day would come. After countless hours wasted on drek like Cthulhu Mansion and Curse of the Blue Lights, I have finally found a film based on the works of H. P. Lovecraft that is both faithful to the source material and also very entertaining and genuinely creepy at times. In fact, this is one of the best horror movies I have seen in a while and Lovecraft fan or not, anyone who likes a well done fright flick with brains as well as blood should check this one out. Director Dan O’Bannon has certainly done an excellent job and this movie surely deserves the same recognition as his more famous works. 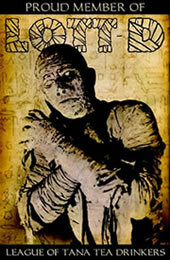 The story, like that of the Vincent Price classic The Haunted Palace is based on Lovecraft’s "The Case of Charles Dexter Ward" and writer Brent V. Friedman, who also penned the screenplay for the Lovecraft inspired anthology film Necronomicon has taken very few liberties with the original work. The largest and most notable change is the decision to set the tale in the present (1992) instead of the late 1920s when the story was written. This change, however, does not detract from the effectiveness of the tale and with a fine cast and expert direction by O’Bannon, the audience is quickly drawn into the feeling of mounting dread that is so much a part of Lovecraft’s writing. The film starts with Providence, Rhode Island private investigator John March (John Terry) who gets things off to a good start with a very well crafted and nicely delivered first person monologue that puts us immediately in mind of dozens dime novels and film noir classics, but which is also full of that famous Lovecraftian foreshadowing. March tells us of a recent visit from the lovely Claire Ward (Jane Sibbett) who is very concerned about her husband Charles (Chris Sarandon). It seems that Charles had been conducting mysterious experiments in the couple’s boat house until, unnerved by the horrid smells and unnatural noises coming from her husband’s lab, Claire told him to take his obsession elsewhere. After moving his strange operation to a farmhouse left to him by long dead relative and reputed occultist Joseph Curwen, Charles has gotten into trouble with the police who have discovered that he has been receiving regular shipments of disinterred human remains. What could he be doing that requires human remains and the delivery of hundreds and hundreds of pounds of fresh meat. Claire hires March to find out what her husband is up to. Taking the case, March soon begins to unravel a terrible tale of familial evil, ghastly experiments to re-animate the dead and more. I can’t give much more detail without spoiling the building tension that is created by March’s investigation and his visits to Ward’s new lab. If you know Lovecraft, you know what he finds can’t be good for mankind and it will forever change the way March sees the world around him. The Resurrected is a very well made, often creepy and sometimes frightening film that has been made with a finesse and skill that belies its virtually unknown status. The gore, and there is plenty, is used very effectively. It is never there unless it needs to be and when it needs to be, it is shocking because it is abundant, but never overused. Some of the scenes, like the ones in the catacombs below the Curwen farmhouse are some of the most effective and suspenseful scenes I have seen in a horror film in a long time. When March and his cohorts discover a pit full of Ward’s "failures" and find themselves surrounded by unspeakable horrors with only flickering match light to separate them from total darkness, the audience can't help but feel a chill. Each time a match goes out and another is lit, we are never sure what horror it will illuminate and from what direction it will come. 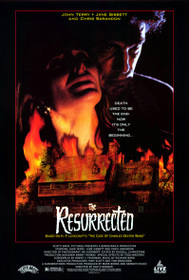 If you are a Lovecraft fan or are just looking for a good "scary" movie, you can’t do much better than The Resurrected. I’ve had this one for several years and I can’t believe I hadn’t realized how truly excellent it was until just recently. My only wish is that O’Bannon and Friedman get together again to do a movie inspired by one of Lovecraft’s Cthulhu mythos tales. If done with he same care and quality as The Resurrected, it would truly be a horror masterpiece. Lions Gate's full-screen DVD of The Resurrected quotes this very review on the cover.